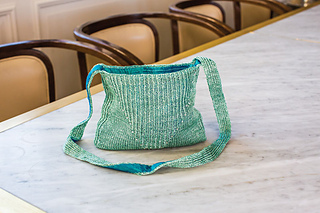 A quick and satisfying knit from unusual silk ribbon yarn, this bag combines simple stockinette stitch and ribbing. 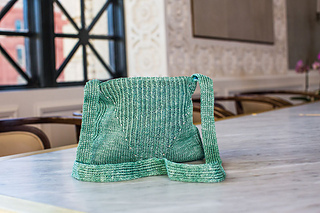 The beads add extra sparkle to the shiny silk, enhancing the elegance of the piece. Choose a color that matches your favorite cocktail dress and you’ll have a great accessory for a dressy occasion. Finished Size 8.75” wide and 7.5” deep. Yarn DyeForYarn Silk Tape (100% silk; 328 yd 300 m/1 3/4 oz 50 g): ex jewel beetle, 1 skein. Needles Size 2½ (3 mm): One or two 32” circular (cir) (see Notes). Adjust needle size if necessary to obtain the correct gauge. Notions Markers (m); waste yarn; tapestry needle; size 0.6 mm steel crochet hook; 50 size 6/0 seed beads; ½ yd of 44” wide silk fabric for lining; sewing needle and thread to match. Gauge 24 sts and 39 rows = 4” in St st.